So I discovered today that putting a quilt top on my table to work on later might not be the best idea. Right now I'm still learning quilting and just working on my own projects so not a huge deal. If I ever start doing customers quilts I will probably need to make my sewing room a cat free zone. LOL, a comfy cat hammock. Yes..if I leave my studio door open for more than two minutes, I have a cat on the quilt. I have the same problem with my quilts too! Can you say COZY? Even Kitty knows quilts are the best! I found that if I unlocked the roller for the day, the quilt still looked like it had tension on it. When the cat jumped on it, it sagged down and the cat got scared. That was an easy fix to keep the cat off of the quilt. 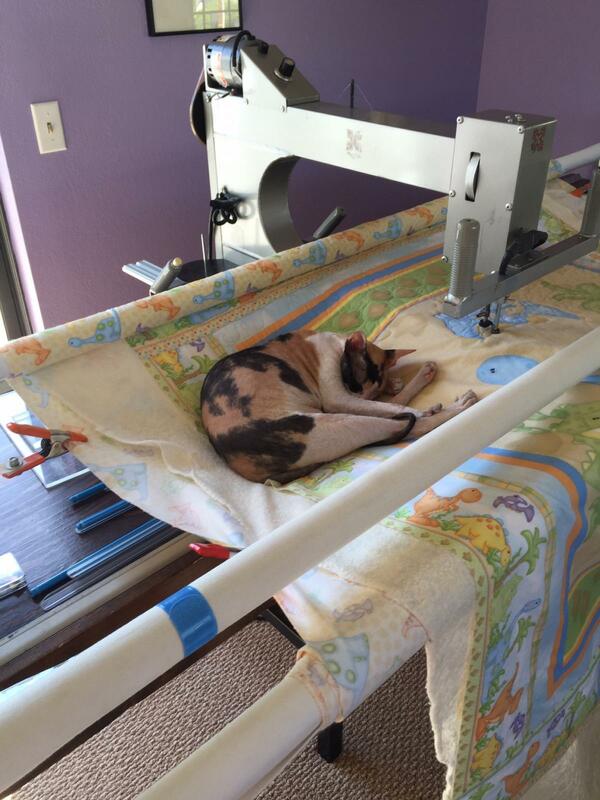 If you do customer quilts down the road,you should let them know you have a cat who loves your quilting studio. You can and will have customers who do have allergies to cats. It is best to disclose pet Information. My business is listed as per free and smoke free, since I have allergies to both. oh yeh! tell me about it. I have 2 cats, only one gets up there as the other is blind. they have to be involved in the entire inspection process don't ya know! Cats are nearly deadly to my friend in Mt. She can tell when a cat is in the room as she starts to have bad breathing problems, and needs immediate fresh air. Her reaction is the same if a cat lover hugs her or is standing lose by. I did the same as Charlene and it worked with my Charlie. When I had my frame in the living room went through the same thing with my two cats....one on each side of the machine laying up thinking I built the frame strictly for them. They loved it. Comfy kitty! My cat has done the same thing . . . I shut the quilting room door now when I'm not in there . . . cats just love being where they are not supposed to be!!! Bev 2012 Blissed Freedom aka "Freeda"
We have three cats and they all do that. I put solid surfaces over the loaded quilt and they just go under them to sit on the quilt. I also put extra batting under the surfaces hoping that would keep them out, but they still managed to lay on the quilt hammock. I never thought about unlocking the roller. I will have to try that.